Friday night, France suffered an immense tragedy following terrorist attacks in Paris that left over 120 dead and many others wounded. World leaders have quickly offered statements of support to Francois Hollande and France, extending their deepest condolences for the victims and their families, including President Obama, who made a statement late Friday night, calling the incidents "an attack on all of humanity." Around the world, national monuments have been lighting up in red, white, and blue to show support for Paris and the nation of France. The French police have confirmed that there were six attacks, including one bombing and two suicide attacks near the Stade de France and several attacks in the 10th arrondissement's Republique area, at two restaurants and the Bataclan concert hall, with 80 people reported dead in a hostage situation. Authorities report that over 120 people have been killed and many others are injured. French President Francois Hollande has declared these attacks as an "act of war" and blamed ISIS for the massacre. ISIS has since claimed responsibility for the Paris attacks, saying that these are the "first of the storm." 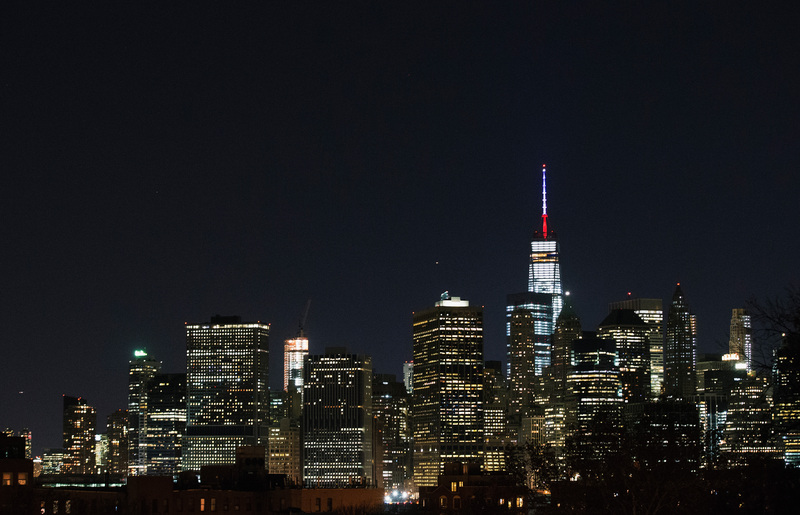 Friday night, following the news of the terrorist attacks in Paris, Governor of New York Andrew M. Cuomo decided to show solidarity with France by lighting One World Trade Center in red, white, and blue, the colors of the French flag. Australia showed support for the French capital by turning the famed Sydney Opera House red, white, and blue. Sydney's town hall was also lit in the colors. On Friday night, the Paris Las Vegas Hotel announced that it had turned off the lights of its Eiffel Tower in deference to the victims of the terrorist attacks. San Francisco stood with France, lighting its city hall red, white, and blue. The San Francisco City Hall has also hung a French flag. Brazil lit the Christ the Redeemer statue in red, white, and blue on Friday evening in support of France. New Zealand showed support for France, lighting up both the Auckland Sky Tower and the Auckland Museum in red, white, and blue. The Washington Captials hockey team lit up the interior of the stadium in red, white, and blue. Brazil lit up its Beria-Rio stadium in the colors of the French flag. Mexico's Angel de la Independencia was red, white, and blue Friday evening. Shanghai's Pearl Tower shined in the colors of the Tricolore after the Paris attacks on Nov. 13, 2015. The CN Tower in Toronto lit up to show solidarity with Paris. London's Wembley Stadium lit up in the colors of the French flag. The Omni Hotel in Dallas resembled the French flag on Friday night to show support for Paris following the terrorist attacks. The Calgary Tower showed support for Paris with red, white, and blue lighting. Taiwan shows support for France by lighting up the Taipei 101 Tower.